What happens if the “super committee” fails to meet its target of $1.5 trillion in budget savings by Thanksgiving and sequestration is triggered? 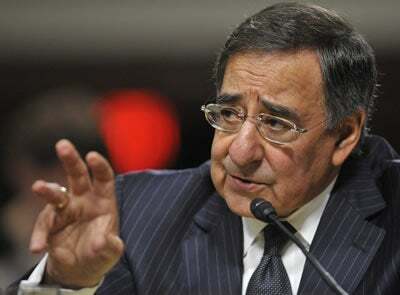 It would spell doomsday for the military, Defense Secretary Leon Panetta warns. Such a large cut, applied in this indiscriminate manner, would render most of our ship and construction projects unexecutable – you cannot buy three quarters of a ship or a building ­and seriously damage other modernization efforts. We would also be forced to separate many of our civilian personnel involuntarily and, because the reduction would be imposed so quickly, we would almost certainly have to furlough civilians in order to meet the target. These changes would break faith with those who maintain our military and seriously damage readiness. 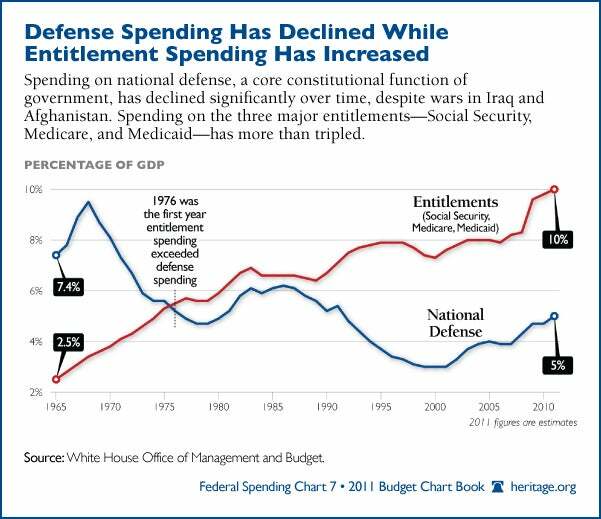 As the military sits on the chopping block, spending on the three major entitlements—Social Security, Medicare, and Medicaid—has more than tripled (as the chart below shows). And that’s despite wars in Iraq and Afghanistan–and the fact that defense is a a core constitutional function of the federal government. Conservatives, please remember and achieve the objective: drive federal spending down — including by fixing ever-expanding entitlement programs — toward a balanced budget, while preserving our capability to protect America, and without raising taxes.